How do I import my Apple contacts into Wealthbox? 1. 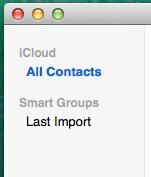 Open “Contacts” on your Mac, then click on the group you would like to export (e.g. “All Contacts”) on the left side. 2. Click “File”, then “Export”, then “Export vCard” and save the file. 4. Choose your saved vCard file, click “Upload and Import”, then on the next screen click on the “Import” button again.